Ever since the release of Kaffir Boy I have made it a point to read all of the African memoirs that I have come across. With their lyrical use of the English language these books have a way of reaching out to the reader and making you a part of the story. Coupled with the natural gift of storytelling these books can be enjoyable and informative at the same time. 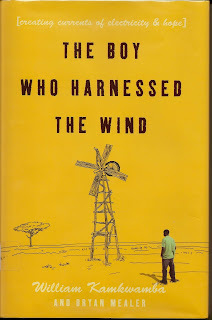 In “The Boy Who Harnessed the Wind” by William Kamkwamba these assets are combined, making this book a joy to read. Coming of age amidst the turmoil that is Africa today, Mr. Kamkwamba, with the skillful aid of Bryan Mealer, tells the story of his life in his village in Malawi, located in Eastern Africa. Through the trials and setbacks arising from changing politics to the devastation of famine Mr. Kamkwamba persists in his quest for knowledge. When he can no longer afford to attend school he spends his time at the village library absorbing all he can about science and electricity. His plans progress from the simple desire to hear music to the concept of what electricity really means. An extra harvest each year, no more carrying water several kilometers to water the crops. And so he begins a quest to find the materials he will need to make his vision a reality. He is going to build a wind driven turbine. The most amazing thing about this book is having Mr. Kamkwamba, who had never seen a power plant, describe the basics of electro magnetism in a way that anyone can understand. And when his dreams become actions that reshape the way his family lives you simply want to cheer! Another aspect to this book is the feeling that so much is wasted in our own lives- so many opportunities squandered. You read this book and feel the loss of ambition that plaques our own society. A lyrical and exciting read by an author who takes you on his journey of discovery. And that journey leads you to examine your own life and what effect you have had, or not had, on the world that surrounds you.